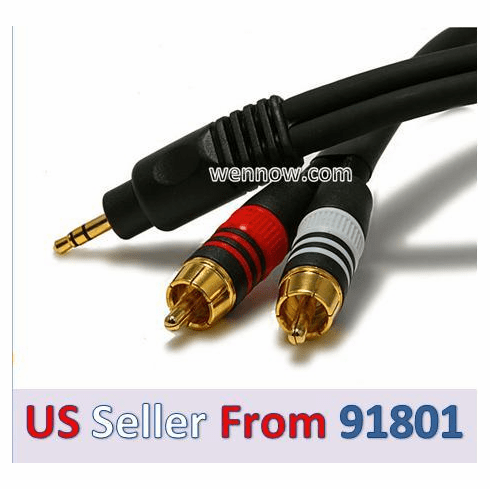 If you want really BIG SOUND from your portable media device, cell phone or PDA that has a micro 2.5mm headphone jack, nothing beats connecting it to your home's main audio system. This premium 2.5mm micro headphone plug to 2 RCA (right/left) stereo patch cable is what you need to bridge the gap. Simply plug the 2.5mm plug into the headphone jack of your compatible device and the 2 RCA's to the left and right auxiliary inputs on your sound system. Features: Gold plated connectors for corrosion resistance and reliable connectivity. Heavy duty 22AWG wires for lower signal resistance and stronger signal integrity. 12mm x 6mm thick cable bodies! Shielded to resist external signal interference. Molded connectors. Extra heavy duty 2.5mm connector housing. 15mm Diameter x 41mm Long! Note: This cable features a 2.5mm plug, which is NOT standard headphone jack size. A standard headphone jack is 3.5mm. 2.5mm connectors are commonly found on cell phones and PDAs. However, this cable will not work with all cell phones. Before purchasing, please make sure your cell phone is compatible with 2.5mm TRS plugs (the ones without a mic conductor).